What does everyone want to show off after years of training in a gym? GUNS! Everyone wants huge bulging biceps that peak like you have a softball under your skin. Try these bicep workouts for huge gains! 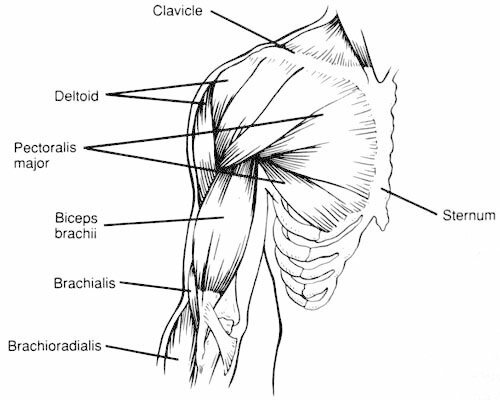 The biceps brachii is a muscle on the upper arm that acts to flex the elbow. It is given the name biceps because it has two heads, and brachii comes from the Latin word for arm. The brachialis muscle is the main flexor of the forearm. It arises from the distal, anterior half of the humerus and the intermuscular septa. It inserts into the coronoid process and tuberosity of the ulna over the elbow joint. 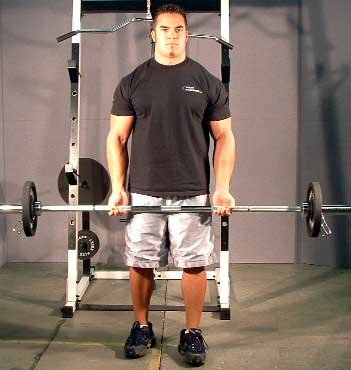 Standing barbell curls are a basic movement that work the biceps and forearms. Grab a barbell with an underhand grip. Stand with your feet shoulder width apart. Let the barbell hang in front of you at arms length. Keep your elbows close to your torso at all times. Moving only your forearms, use your bicep strength to curl the barbell up to shoulder level. Hold this position for a second to maximize the peak contraction in the biceps. Slowly lower the barbell to the starting position. Repeat. Do not lift excess weight and use momentum to swing the barbell up. Use a lighter weight and keep the movement slow and controlled. For variety you can use different types of barbells (i.e. an ez curl bar) to work the muscles at different angles. You can also do this exercise with a bar attached to a low cable pulley. Standing Dumbbell Curls are similar to the barbell curl. It works the biceps and forearms. Grab a pair of dumbbells. Stand with your feet shoulder width apart. Let the dumbbells hang at arms length on each side of your body. Keep your elbows close to your torso at all times. Moving only your forearms, use your bicep strength to curl the dumbbells up to shoulder level. Rotate your hands so that your palms are facing upwards at the top. Hold this position for a second to maximize the peak contraction in the biceps. Slowly lower the dumbbells to the starting position. Repeat. Do not lift excess weight and use momentum to swing the dumbbells up. For variety you can do this exercise with one arm at a time. 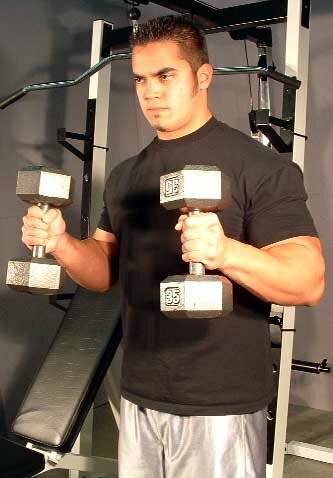 Dumbbell Hammer Curls are similar to the dumbbell curl. It works the biceps, brachialis, and forearms. Grab a pair of dumbbells. Stand with your feet shoulder width apart. Let the dumbbells hang at arms length on each side of your body. Keep your elbows close to your torso at all times and keep the palms of your hands facing each other. Moving only your forearms, use your bicep and forearm strength to curl the dumbbells up to shoulder level. Do not rotate your hands as you curl the dumbbells. Hold the top position for a second to maximize the peak contraction in the biceps. Slowly lower the dumbbells to the starting position. Repeat. 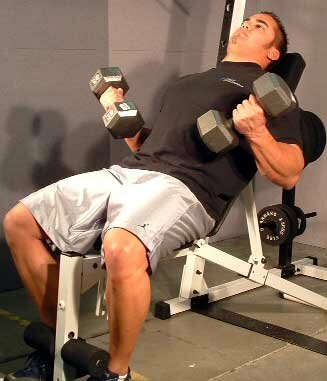 Incline Dumbbell Curls are similar to the standing dumbbell curl. It works the biceps and forearms. Grab a pair of dumbbells. Sit back on an incline bench with your feet shoulder width apart. Let the dumbbells hang at arms length on each side of the bench behind your body. This exercise isolates and stretches the biceps more then standing dumbbell curls so you will have to use less weight. Moving only your forearms, use your bicep strength to curl the dumbbells up to shoulder level. Hold this position for a second to maximize the peak contraction in the biceps. Slowly lower the dumbbells to the starting position. Hold this position for a second to really stretch the biceps. Repeat. 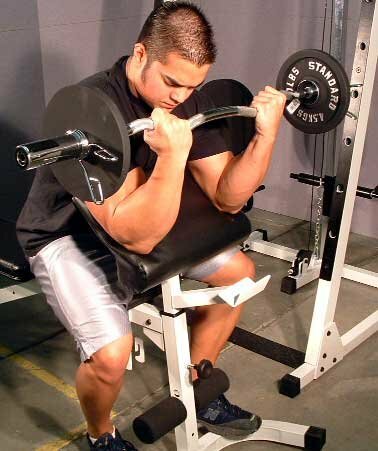 Preacher Curls isolate the biceps. Secondary stress is applied to the forearms. Sit on a preacher bench with your upper arms lying flat on the pad, palms of your hands facing up. Have a training partner hand you a barbell. Lower the barbell until your elbows are almost straight and you feel a good stretch in the biceps. Moving only your forearms, use your bicep strength to curl the barbell up to shoulder level. Slowly lower the barbell back to the starting position. Hold this position for a second to really stretch the biceps. Repeat. Since this is an isolation exercise use lighter weights and really focus on using perfect exercise form. For variety you can do this exercise with dumbbells instead of a barbell. 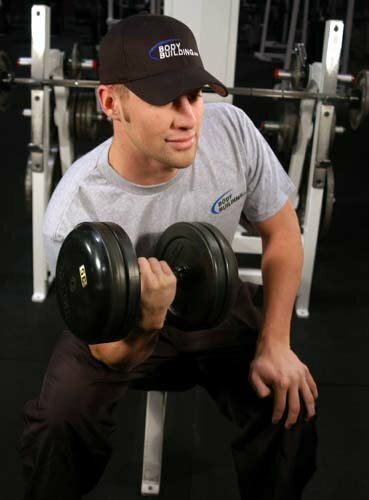 Dumbbell Concentration Curls isolate the biceps and are good for getting a peak contraction in the muscles. Sit at the end of an exercise bench with your legs spread. Reach down between your legs and pick up a light dumbbell with one hand. Brace your elbow against your knee and fully straighten your arm. Place your other hand on your opposite leg to support your upper body. Moving only your forearm, use your bicep strength to curl the dumbbell up to shoulder level. Hold this position for a couple of seconds to maximize the peak contraction in the biceps. Slowly lower the dumbbell to the starting position. Repeat for the desired number of reps. Do the same for your other arm. You must make sure you use proper form not only to help prevent injuries but to also make sure you aren't cheating yourself out of lean mass gains by using incorrect form and by bringing other muscles into the lift. Since everyone is different, not every exercise mentioned will work for everyone. The best thing to do is to try different exercises and see what works for your body. Some people find that working the muscle directly (specific bicep exercises) gives them the best gains while others find that working it indirectly (working the back muscles which uses the biceps in the exercise as well) they get the best gains. The following workouts are from members of the forum (hence the title "Å¦amp;quot;Best Bicep Workouts of The Bodybuilding.com Forums"). Enjoy! 3 exercises/4 sets each for the bis, and they are fried after this. Click Here For A Printable Log Of King Crush Workout. Notes: Some people do not like doing 12+ sets for biceps (most people will consider this many sets as overtraining). However, some people will find that they make great gains using this training protocol. I would not recommend doing a workout such as this along with a back workout, nor the day before/after a back workout. Your biceps need an adequate amount of rest to recover and grow. I like keeping my bicep workouts short and intense, normally I wouldn't recommend 12 sets and I definitely wouldn't do more than that, but 12 sets might be just what people need for their body to grow (trial and error, see how your body responds). Here is the link that you can check out the whole thread. I would opt for a mass builder first - Barbell curls 3 sets of 8, then maybe some concentration curls, for height - then run the rack with alternating DB curls - OR incline curls. Click Here For A Printable Log Of Da Main Man Workout. Notes: This in my opinion would be a great bicep workout. It involves a mass building exercise, an exercise for peak, and then a complete exhaustion exercise. With this workout you will get under 10 working sets and will have an intense workout when it is finally complete (intensity is very important, you want to keep the intensity high to get the most out of your workout). Here is the link so you can check out the whole thread. Click Here For A Printable Log Of Week 1. Click Here For A Printable Log Of Week 2. Notes: This is a good 2 week workout plan. Each workout involves different exercises which hits the muscle fibers a different way. A 2 week plan such as this also changes things up so your workout doesn't become stagnant and it helps keep your muscles guessing from week to week. After doing the same exercises for weeks at a time, your muscles will get used to stimulus and will stop growing; therefore, it is best to change things up every couple of weeks to keep things fresh and new. Here is a link to the thread. I would highly recommend that you periodize your reps from one workout to the next. 6 reps 1 week, 12 reps the next, then 8 reps, then 5 reps, then 10 reps. I train my biceps 2x per week. Notes: This style of training helps keep everything fresh and your muscles guessing. Too many times do I see people in the gym who you can literally tell them what they are about to do next because they do the same bicep exercises every week. It's good to change things up constantly to make your muscles adjust to new stimuli, therefore shocking the muscle into growing. Also, like powerman2000 mentioned, some people find training a muscle group twice a week helps bring up lagging body parts. Personally, I like hitting each body part once a week, and then give it a full week to recover and grow until I work that muscle group again. You really just need to use trial and error to see what your own body responds to best. Your body might like that style of training while other people would be overtraining if they did a workout such as that for a long period of time. Here is the thread that you can take a look at if you wish. Click Here For A Printable Log Of Jesin Workout. Notes: What I like about this workout is that it is very basic, short, and intense. 6-8 sets with minimal rest will definitely fry your biceps and if they aren't fried by the end of the workout, you need to increase the weights (make sure you keep good form) or increase the intensity by using shorter rest periods. Here is the link to the thread. Curl the DB's for 6-8 reps making certain to have a slow negative (4-6 seconds on each negative. Negative being where you lower the weight). Then put down DB's and take deep breaths for 15-20 seconds. Then pick up the DB's, curl (w/ slow negative) for 2-4 reps.
Then put down the DB's, take deep breaths for 15-20 seconds. Then pick up the DB's, curl (w/ slow negative) for 2-3 reps. Pick up the DB's and hammer curl for 6-8reps w/ slow negative. Then put down the DB's and take deep breaths for 15-20 seconds. Then pick up the DB's, hammer curl for 2-4 reps w/ slow negative. Click Here For A Printable Log Of $AJ Workout. Notes: What I like about this workout is that it is brief but SUPER intense. I would not recommend using this workout every week; it is a good workout to use if you hit a plateau or if you want to really stimulate the muscle fibers differently than what you have been in the past. Here is a link to the whole thread. The best bicep workouts are chin-ups, pull-ups and BB rows. In my experience doing less direct bicep work and more indirect bicep work caused my arms to grow. In other words, I threw a mini bicep workout into my back workout. I indirectly worked my biceps with: Deadlifts (reverse grip works best IMHO,) Pulldowns, and clean + presses. Click Here For A Printable Log Of Smorkinlabbit Workout. Things have been working pretty well so far, maybe it'll work for you. Notes: This is a good combination of indirect exercises. At the end of the workout after exhausting the biceps with the indirect exercises, he comes back and specifically works the biceps to completely fatigue the biceps. This is a great idea if you need a little more bicep stimulus when the indirect protocol just isn't enough. Here is a link to the exact thread. Notes: This is another good workout which combines direct and indirect stimulation to the muscle; you incorporate bicep work in with your back workout. By adding in a couple sets of bicep work at the end of back training really finishes off the biceps which would already be fatigued by the back training. Here is a link to the thread. Click Here For A Printable Log Of Overload Workout. Notes: This is a great quick 12 set workout which hits both back and biceps. I would recommend keeping this workout super intense with short rest periods. This workout uses some good indirect and direct stimulation of the bicep. Here is a link to the thread. There are many different ways that you can stimulate the biceps, direct/indirect and both. You can use just about anything in the gym to stimulate the muscle (barbell, dumbbell, cables, tubing, bodyweight). You can use several different techniques to stimulate the muscle as well: negatives, super-sets, rest-pause, 21's, and super slow training just to name a few. However, the best single exercise to put some serious mass on your biceps is the straight bar curl. If mass is what you are looking for then you definitely need to add the straight bar curl to your workout (preferably in the beginning when you have the most energy). One of Arnold's favorites. Using the curl as an example, you would do 7 full reps followed by 7 half reps from the starting position to half way up followed by 7 half reps from half way up to the top of the movement. All of this counts as one set. A huge misconception is that you can be 150 pounds with 6% body fat and have 18 inch arms. Frankly, it's not going to happen, and if you are in fact similar to what I just mentioned, then pat yourself on the back because you are straight up A FREAK (in a good way). To gain size on ANY body part, you need to bulk. In a nutshell you have to increase your calories so that you are taking in more than you are burning off. A good start would be to find out how many calories your body needs a day, and then add up to 500 more calories to that number. I recommend you give some of the above workouts a try and see how they work for you. Who knows, maybe in a couple years your arms will look like Greg Valentino's (or maybe not).